Thank you for supporting Urban Sketchers this year. We take pride in the diversity and inclusiveness of our community, and appreciate the participation of so many people around the world. Thanks to your support, we held our largest Symposium yet this year in Singapore, with 393 participants. It was our first symposium in Asia! For many of us, it was a very long flight and the weather was hot but so were the workshops and activities! Our participants agreed that the new friendships and the skills they learned made the symposium a valuable and memorable experience. Thanks to your support, USk granted scholarships to 10 local sketchers who attended the symposium at no charge! Scholarship winners were nominated by their lecturers, professors, teachers, or mentors, and selected by the Singapore Symposium Committee based on their demonstrated interest in sketching, their CVs, portfolios, and letter of motivation. We’d like to do this again so that more people will have the opportunity to attend the symposium in 2016. Also, thanks to your support, USk hosted 14 outstanding workshops around the world in 2015. 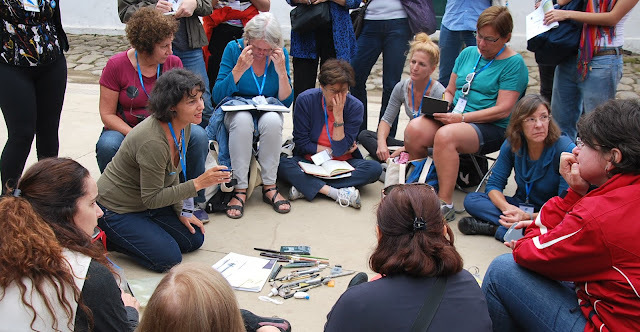 Two hundred sixty sketchers participated altogether, learning more about setting a point of view, sketching people in action, creating atmosphere, and more from Naples to Miami to San José, Costa Rica to Segovia! In the coming year, our all-volunteer organization is planning the 7th International Symposium in Manchester, England, for July 27-30, 2016. Many new workshops are coming up, in addition to exciting new projects. It’s a great time to be a part of Urban Sketchers, and we need your help to keep up the good work! If you believe in the USk mission and manifesto, please consider making a donation today. (Donations are tax-deductible for US residents.) We suggest a $20 donation, but pledge as much or as little as you like. Every little bit helps! Let's work together to continue "Showing the World, One Drawing at a Time"!